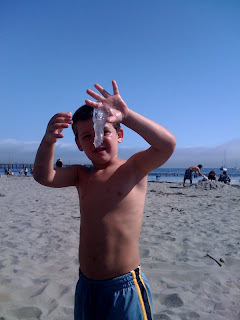 The Christophersons: Jellyfish or Nasal Discharge? Ammon displaying one of his new beach toys! If the kids are any thing like their daddy then there is no question- that is definitely a big moco. That was REALLY disgusting at the beach. And now I'm afraid that the kids don't get that those things can hurt you when they are alive!! !